See my other website, Somafera, for in-depth discussion of the practice of berserkergang as well as mainadism, Heroic Feats, dervishes, and other types of spiritual/physiological transformation. I also maintain a Somafera Blog. The information and practices described in this site are the result of years of study and dedication to the understanding of the risks involved. These descriptions are provided for purposes of information only. Actually trying to practice anything described in this site would almost certainly lead to injury, perhaps even serious injury or death. I strongly advise against it. The berserkergang was the practice of a kind of elite viking warrior, called a berserk. The meaning of the word berserk seems to have varied from place to place. It sometimes seems to mean "bare of sark," referring to the practice of the berserks of fighting without armor. It also sometimes was used as "bear-shirt," referring possibly to another practice of fighting in an actual bearskin or to the belief that the berserk somehow changed into a bear. Some kinds of berserks (in the first sense of the word) were referred to as "ulfhedinn," meaning wolf-coats in the same sense as the second meaning of berserk. There may also have been boar-berserks and cat- (of the large predatory variety) berserks. "What people say about shape-changers or those who go into berserk fits is this: that as long as they're in the frenzy they're so strong that nothing is too much for them, but as soon as they're out of it they become much weaker than normal." "… his men went without mailcoats, and were as frantic as dogs or wolves; they bit their shields and were as strong as bears or boars; they slew men but neither fire nor iron could hurt them. This is known as 'running berserk'." But what were the berserks? The berserkers were described as "Odin's men." They were often described as fighting together in bands of twelve or thirteen, and mention is sometimes made of brotherhoods of berserkers. It seems that the berserkers were practitioners of a mystery (in the old sense of the word) of Odin, an ecstatic religious state that granted them their formidability in battle. In this they differ from the other common kind of Odinic devotee, in that they were not usually noblemen and the gifts Odin favored them with were power and madness, rather than battle strategy and information. (And it says something important about Odinic nature that his two standard chosen types are those on top of society or those outside it entirely. Both are free of society's constraints, and so are free to follow their individual wyrds withersoever they will.) But while modern Asatruar often attempt to imitate the aristocratic sort of Odinsman, the berserker kind of Odinic worship seems to be almost entirely absent in modern times. And this is a shame, for in many ways the path of the berserker is a closer, more intimate relationship with the god. But what exactly was the berserkergang? 1)Alcohol induced. The theory here runs that an excess of alcohol could have lowered inhibitions in the minds of the berserks, leaving them short-tempered and prone to bouts of rage, as well as willing to both inflict and suffer great harm without really noticing. 2)Amanita muscaria induced. This theory holds that the gangr was brought about by ingestion of the psychoactive mushroom amanita muscaria (possibly the famous soma of India). The mechanism here is supposed to be the great strength and endurance the mushroom is said to give to those who ingest it, and that the rage could be triggered by the plant's psychoactive properties. 3)The berserks never existed. This school of thought holds that there is more of the fairy-tale creature than the real human to stories of the berserks, so as no easy explanation can be found for the gangr, they must never have existed. 4)Self-induced frenzy. This theory holds that the gangr was a self-induced religious ecstasy that prompted a temporary change in physiology. My research into berserkers and the berserkergang has lead me to the following conclusions regarding these four theories. 1)Couldn't possibly be alcohol induced. Drunks just aren't formidable fighters. If you are so drunk you are prone to uncontrollable rage, you are too drunk to stand or to walk straight. And the anaesthetic effect of alcohol is a tricky thing. One touch of real pain and the recipient often sobers up real fast. This is why doctors and dentists switched from alcohol to chloroform as an anaesthetic as soon as it became available. 2)Extremely unlikely to have been brought about by amanita. While on the surface this seems like a very plausible explanation, backed up by the pharmacology of the mushroom, there are some serious problems with it. First of all, there is no record anywhere of its having been used for this purpose. There is very little evidence the vikings even knew it existed, except for in isolated pockets. Also, the mushroom is restricted to a limited growth season only in certain soil conditions in symbiotic relationship with the right trees, and only in temperate zones. There is no evidence that off this season berserks didn't fight. And berserks are also spoken of in Iceland, where this mushroom most definitely did not grow. Additionally the mushroom not only induces nausea in its initial stages, the effects - and lengths of effects - of the mushroom vary widely from one "trip" to the next. It would just not be practical to depend upon soldiers who might be unpredictably heaving their guts out when the battle started. And most tellingly of all, berserks are spoken of as having the berserk fit "come over them" at unexpected times. Hardly consistent with mushroom (or any other entheogen) ingestion. 3)It seems unlikely that berserks were entirely a product of story. They were spoken of too consistently in too many sources over too long a period of time. And problems involving them are mentioned in legal sources. In fact, during the Christian "conversion" strong laws were enacted against going berserk, lengths which would not have been gone to for imaginary fairy-tale creatures. 4)My conclusion is that the berserkergang was self-induced, a form of religious ecstasy. My reasons for this conclusion are several. First of all, Egil's Saga (as well as other sources) speak of the gangr as something that could come upon a berserk unexpectedly. Fabing cites sources that claim it could be brought about by laborious work. The Byzantine emperor Constantine VII refers to the "Gothic dance" of his Varangian Guard, which was ceremonial in nature and involved dressing in animal skins. (While it is not recorded whether the Varangian Guard were berserks - a term Constantine would not have known - they certainly are described in a similar manner.) 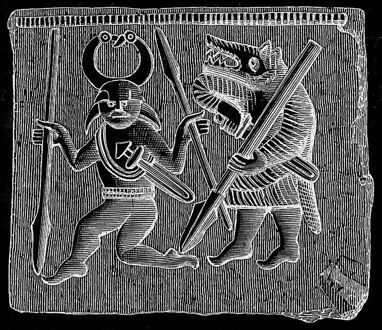 In a similar vein, artifacts such as the Torslunda plate show Odin dancing with animal-skinned warriors. In the Volsunga Saga Sigmundr (chosen of Odin) and his son Sinfjolti put on wolf-skins and become nearly invincible. Berserks are described as leaping about before battle, or pacing like a caged animal, or biting upon their shields. Statues that may be of berserks show the warriors pulling strongly upon their beards (which is rather painful, to all you non-bearded persons). The thing each of these last examples have in common is that they would all tend to induce high adrenaline states, either through pain or through exertion, which is certainly consistent with descriptions as a cause of the gangr. And lastly the berserkergang is a phenomenon that is hardly unique to the vikings. The Greek maenads, female devotees of Dionysos, are described in a virtually identical manner (and yes, they were fighters according to legends of the wars in India). The Celtic Heroic Feats, practiced by such warrior bands as the Feanna, seems also identical. I might also mention the leopard-men of Africa, the wolf-warriors of the ancient Middle East, and possibly the Indonesian "Running Amok". And in many of these other cultures these practices are spoken of as something self-induced. So if the gangr was self-induced, how was it induced? 1)Physical adrenaline triggers such as dancing, leaping, posturing, etc. that initiate adrenaline by repetitive motion of large muscle groups (a well-known cause of adrenaline release). 2)Physical adrenaline triggers such as shield-biting, beard-pulling, cutting, etc. that initiate adrenaline by pain, another well-known adrenaline inducer. 3)Excitement, another adrenaline trigger, as in Egil's ball game or just before battle. 4)Sympathetic invocation of an animal spirit by wearing its skin or acting in a manner consistent with the animal. This seems to put the mind in a receptive state for becoming like an animal's mind. 5)With the help of the god Odin. Let me expand upon this last one before continuing. The meaning of the name Odin is roughly "stirrer to fury". This is certainly consistent with the hypothesis that adrenaline is a major component of the berserkergang, as fury is a major result of excess adrenaline. But here is where we must be careful. This is an old word, od (or wod, depending upon place and time), and "fury" or "rage" are only translations. They have certain implications to us modern folk that the ancient heathens may not have shared. Od means not just fury in the sense that we use it, but it also seems to mean possession, as by a spirit or god. Thus the fury of the berserkergang is no mere display of bad temper, or uncontrollable rage, but it is something transcendant, something holy. It is an ecstatic state. Possession is an unusual state of mind wherein unity is attained with a god or spirit, where the boundary of the ego that separates the self from the god or spirit is erased. In essence, the one possessed "becomes" the god or spirit in question. This practice is found in many different religions, from the obscure to the commonplace. The practitioners of Vodoun engage in it when they become "ridden" by the loa. It is also found in Catholicism, under the term Mysterious Union, where the practitioner (usually a monk or a nun) becomes one with the Christian god for a time. So it would seem that the berserkergang began with fury as we modern people understand that term. The berserk would use various physical techniques to get himself into an adrenaline high, and would then apply further techniques of religious and/or sympathetic ritual and become possessed, entering into an ecstatic state, and becoming a wolf, or a bear, or even maybe Odin himself. But could a hypothetically valid technique be developed to induce the berserkergang? In order to do that one would need to know what possession is in a fairly detailed sense in order to take a guess as to a valid ritual to bring about possession. But little lore survives from heathen times as to exactly how they went about such things. Fortunately, while cultures change the human brain remains more or less the same. Recently a team of neurobiologists undertook a study to determine the causes of religious experience in the brain. Anyway, one of the specific religious experiences the neurobiologists studied was the Mysterious Union, the Catholic mystic practice of possession. While the religion greatly differs, the processes that the brain utilizes must be very similar. I will summarize the relevant findings they published in their book, Why God Won't Go Away. There is a portion of the brain called the posterior superior parietal lobe, or the orientation association area (OAA, to save much typing). The OAA orients the individual in space and in doing so distinguishes the individual from everything else. (In other words, it also makes the distinction between "me" and "not-me".) The OAA shows heightened activity during different forms of meditation, and during the deepest meditational states it sharply reduces in activity. The human body contains two divisions of the autonomic nervous system (the bridge of nerves between brain and body). One is the sympathetic nervous system, which arouses the body, gives an adrenaline boost, increases heart rate, blood pressure, breath rate, and muscle tone. It is often activated by danger or mating. The other division is the parasympathetic nervous system, which quiets the body, conserves energy, keeps the body's basic functions in balance, regulates sleep, induces relaxation, distributes nutrients throughout the body, and plays a role in the body's self-healing functions. These two divisions of the autonomic nervous system are usually antagonists, meaning that either one is "on" or the other, but not both, as they generally inhibit each other's activities. In some extraoridinary states of altered consciousness, when one system or the other is pushed to maximal effort, both will function at the same time. This can be triggered by intense physical or mental activity, such as prolonged concentration. Elevated action of the sympathetic nervous system is a source of stress, in both the physical and emotional senses. The mind desires to be released from this stress. The longer it endures, the greater the stress becomes. This causes the brain to throw all of its resources into finding a resolution to the situation causing the stress. Both the left-brain deductionism functions and the right-brain holistic approach become used. When they match, get in synch, the pleasure centers in the hypothalamus are stimulated. This triggers the parasympathetic nervous system. For one moment the arousal system and the quiescent system are both active. Ecstasy and awe. This is the eureka moment. Maintaining this is called by the researchers the "unitary state." This then is how a god, or a spirit, or a myth is experienced by the brain. It is the unification of left and right brain, of logic and emotion, and because it is the ultimate synthesis of the human brain it feels like ultimate truth. "The ability of human ritual to produce transcendant unitary states is the result… of the effect of rythmic ritualized behavior upon the hypothalamus and the ANS [autonomic nervous system]…." If the rhythmic behavior is fast, the arousal system is driven ever higher. The hippocampus then puts on the brakes and neural input to various areas, like the OAA is reduced. Unitary states are produced by a softening sense of self and the absorption of it into a larger reality caused by this deafferentation of the OAA. There are two types of unitary state that result from this process. I will focus here on the active one responsible for the sensation of the Mysterious Union and other forms of possession. This arises with sustained focus upon some thought or object of attention. This keeps the right part of the OAA active. This part of the OAA is responsible for forming a sense of the space around the individual. The left part, the part responsible for the sense of self, in deactivated in the manner described above. The result of this is a sense of the self merging into the object of contemplation. If the ritual that produced the state is religious in nature, then focusing upon a god or spirit will result in merging with or replacement by (if the deactivation of the left OAA is complete) the god or spirit. And of course to be effective, the ritual attempting to cause the unitary state must merge behaviors with ideas and emotions both. This is why just any idea or behavior will not serve. 1)A light meditative state is entered into, to clear the mind and ready it for what it is about to undergo. 3)Dancing begins. Leaping about or pacing like an animal too. These actions must be in tune with the contemplation. The berserk must dance with Odin. Odin must bring the animal within out, and the leaping must be an expression of that. The object here is to build up adrenaline by moving large muscle groups, and to merge this physical process with the internal, spiritual one. At some point during this process, the simple rage, the lift of the adrenaline will change over into something quite else. The gangr is entered into. But what is the gangr like? What follows is a description of what the gangr is like, based on my own experiences as a berserk. Of course, using the above described ritual, the gangr begins with the stillness of mind brought about by the meditation. As the dancing, posturing, hyperventilation and vocalizations begin, the first change that is noticed is that everything begins to seem a little more sharply defined to the vision. Sounds get a little clearer. The senses begin to sharpen. The prayers to and contemplations of Odin are mostly intellectualizations. The body begins to tense, sometimes all over, sometimes in random muscles. This may cause the hands to become clawlike. Next the emotions begin to spike, randomly surging up in strength. Breathing becomes first rapid and shallow and then alternates with deep, slower, diaphrammatic breathing. There may become an awareness of the space all around you, both in the peripheral vision and even behind. In some berserks the eye color may change. At this point the entire field of vision becomes brilliant and shines. The emotions are running high and there begins to be a high degree of connectivity between the contemplations, acts, and emotions. The mind sometimes becomes easily unbalanced at this point. There may be a trapped, panicky sensation. There may come a certainty that Something Horrible is standing right over the shoulder. Voices that chant or call awful things may be heard. There may be the strange sensation that one is in immanent danger of falling. At this point there is pronounced psychetachia, which is the perception that time outside the body is running strangely slow. Dropped objects may seem to lazily float to the ground. There are several reasons for this.One is the high degree of adrenaline that is in the body at this point. This tends to speed the processes of the mind up. Another is that the berserkergang is primarily a function of the hindbrain, the most primitive part of the brain. As the gangr comes on the forebrain, the most "human" part, functions less and less, even to the point of stopping. Forebrain processes are slow and clunky. When they cease to provide input for the attention there is much less distraction. The primitive functions of the thalamus and the hypothalamus, the brain's "master switches," take over. These are nonconscious, reactive functions. They are the sorts of instinct that close the eyelids when something suddenly moves close to the eye, and move the hand away from a hot pan before there is even a sensation of burn. They are also the triggers for learned instincts, learned patterns of behavior. These can, with training, be quite complex things, but because they are accessed subconsciously, they occur at much more rapid subconscious speeds. A sort of subconscious decision-making can be learned. And the electrical potential in the nerve cells rises and approaches the firing threshold. Thus it takes only a small signal to generate nerve impulses. There is also an increase of strength, due both to the elevated adrenaline and the increased coordination the body moves with. After all, less wasted energy means more energy available to be put into action. The increased resistance to pain may also contribute to this, as more energy can be put into action if there are fewer unpleasant consequences to it. Along with all this there begin strong visions that relate to the prayers and contemplations, as well as the associations that come from the ritual. They will therefore be of Odin, or of the animal (wolf, bear, whatever) in a totemic sense. There may be flashes of having the animal's mind. An animal-like posture is adopted. Growling or snarling may occur. All the hair on the body will begin to stand on end after this, and the skin will become gooseflesh. The pulse is very rapid indeed at this point. (180-220 in my experience. Probably horribly bad for you.) The muscles bulge and the body's tissues and flesh swell from the increased blood pressure (this and the hair standing on end may give the impression that the berserk has grown slightly). The face flushes quite red. This is the height of the gangr, the change. The parasympathetic nervous system kicks in, in response to the enormous stress the body and mind are under. There is a feeling of ecstasy. The unitary state is achieved. There are visions strong enough to completely block out physical sight, even though the eyes are open. The berserk becomes the wolf or bear. Emotion becomes pure. There is hatred rather than anger, joy and ecstasy rather than happiness, love is indescribably transcendant, there is terror rather than fear. The parasympathetic nervous system tries to heal and re-balance the body. And because of the state the body is in, the parasympathetic nervous system has access to all that incredible energy. It is actually capable of healing strains, pains, etc. with remarkable speed. And this increases strength still further, for the berserk can then, say, throw a large rock with so much force it seizes his muscles up in an immovable knot, and they will suddenly relax and unknot and feel as if they'd been resting for days. There is also at this point a foaming at the mouth or drooling in some cases. Psychetachia is extreme. The muscles relax and there is a feeling of "settling back in" a little. There is a feeling like the berserk is a riverbed through which a torrent of emotion and power rushes. Anything the berserk looks at the berserk becomes, attains a unitary state with. This increases the correctness, the rightness of the berserk's responses and reflexes. Hand-eye coordination improves. If the berserk is sparring with an opponent there is an increased accuracy as to anticipation of the opponent's next move. The berserk is in a strange state of "raging control". The mind is relaxed, focused, and pure, and the pure emotions provide a fuel for rapid processing. The object of the berserk's attention becomes his entire world, and everything else vanishes. But reflexes are rapid enough that the unexpected can still be expeditiously dealt with. There is a feeling of being more awake than ever before, of being AWAKE!!! Everything is as it should be, everything is in its right place. But occasionally the berserk will, by acting on instinct, so completely misjudge a situation as to do something really inappropriate and stupid. This is what training in this as an art is for, to reduce the frequency of those occasions, and to learn how to rapidly recover from them. After the gangr comes the fatigue. It is proportionate in length and intensity to the length and intensity of the gangr. (After all, all that energy has to come from somewhere.) The muscles will be a knotted agony. The berserk will often be too weak to stand. A depression sometimes sets in, sometimes getting severe. There is an emotionally "frayed" feeling, and a short temper. It's a good idea to stay away from other people during the fatigue, especially as there is an emotional sensitivity and a propensity to misconstrue other people's meanings. Sometimes the pain in the body is so severe it will trigger another, lighter gangr just to cope with the pain. As there will often not be enough energy left in the berserk to re-elevate deliberately, this is a remarkably lucky happenstance. In this way the berserk slowly "comes down" to a more normal state. The only thing that makes any of the process bearable is the great feeling of peace and wholeness that accompanies it. At this point gorging on a meal high in carbohydrates and protein (preferably containing potatoes) followed by sleep is recommended. But it is difficult to attain these states of mind with no experience of them, and no experience of them is where everybody starts. To give the neophyte an edge, the ancient berserks seem to have made use of an initiation ritual. These rituals, such record as we have of them shows, involved putting the initiate into a dangerous situation, a situation that would require all of his resources. The element of danger, the need, are the best adrenaline trigger, as well as a push to the mind to attain that Something More. In Grettir's Saga Bjorn throws Grettir's cloak into a bear's den. Grettir must go in alone to face the bear single-handedly in a confined space and return with a claw as proof of his experience. Bronze helmet plates from Sweden show humans grappling with bears. In Hrolf Kraki's Saga Hjalti undergoes a simulated battle with a mock monster for the same purposes. When I came to want to practice the berserkergang I realized that I would need just such an initiation ritual. I decided to set up an ordeal for myself in a place with an atmosphere conducive to such a ritual. (I chose a ghost town which legend says was abandoned centuries ago because everyone in it was either a sorceror or a werewolf.) This would help the association of action and emotion needed for the ritual. I spent the month beforehand in prayer and study. Once in the center of the ruins I performed a Russian spell to become a werewolf or oborot as they call it. The act of speaking ritual words while performing ritual actions serves to focus the conscious mind in such a way as to make it open to the upcoming experience. After the ritual (which involved sticking a home-made copper knife into a fallen tree trunk and leaping over it) I went over to a fire that had been built earlier. There I vowed to hold my hand in the fire until I changed, attained union with the wolf. I chose this method because it would provide an element of genuine danger while still being unlikely to actually kill me. It seemed like a good compromise between effectiveness and safety. I started uttering prayers to Odin, knelt, and placed my hand in the fire. I held to the above described ritual to effect the gangr, keeping my hand in the fire. I screamed, and this fed a sense of rage and terror and when the pain became unbearable I felt a moment of almost irresistable need to remove my hand from the fire. When I held on through this, the scream became a howl and I became a wolf. But there is another element to the berserkergang and the berserks mentioned in the myths. Berserks are almost always spoken of as being born a berserk. It seems that though there are techniques for initiating and developing the gangr, it was something that had to be "already within". But how can you tell if you are one? I will relate my experiences with it and pass along information from other berserks I know. I'd always known I was different from other people. I didn't know what it was at first, but I slowly figured it out. I felt differently about everything. I didn't seem to have calm, normal, level emotions. I didn't just feel good or happy, but got wildly enthusiastic about everything (a constant source of embarassment, as others didn't share it usually). I was never just angry, but full of rage and hatred. I didn't usually feel just anxious about things, but was constantly scared. As an adult I've been engaged several times, because I fall deeply in love so easily. I could never adjust my emotions, the way I felt about things, to the way most other people did. This has led to being considered actually emotionless by most people, as I've been forced, through lack of any better ideas, to hide nearly all my emotions. The experience terrified me for a number of reasons. I became obsessively worried about losing control. And my emotions seemed to have changed. I was more… everything. I became angry easier, I laughed easier, I became afraid easier. This was worstened several times by other naturally occuring gangrs, and the fact that I didn't know why any of this was going on. I couldn't handle the constant storm my emotions were in, so I started to shut down. I became unable to talk much to people. I went into the beginning of a depression that often became suicidal and didn't leave me until I became an adult (though now I've been free of it for many years). I spent those years unable to understand almost anything about anyone's motivations. And no one seemed to understand mine (though obviously some of that was just normal teenage idiocy). But I think I must have driven my parents mad. I believe at some points they began to wonder if I was psychotic, or something. I became, in my teenage years, susceptible to visions, and to being overtaken by strange states of mind where I felt I was a wolf. I began to understand a little of what was happening to me, eventually, when my father related a bit of family folklore to me. He described what a berserk was, much as I have above, but without any of the religious or animal-related aspects. He said that according to family lore the berserkergang ran in our family. I thought it might have something to do with what I was experiencing, but I didn't at the time give it much consideration. I then went into the practice of Asatru, via a brief attempt at Wicca. I became drawn to Odin in a priestly capacity. I dedicated myself to him, first in very superficial ways, then in deeper ones. I tried to take up the practice of seidh, but it took years to work out a system that seemed consistent with ancient descriptions and actually seems to work. I began to relate to Odin as a seidh-man. I eventually came to feel that there had to be a closer way of working with Odin, and studies of the sagas in search of exemplary models led me to the berserkergang, and that brought back my father's tales, and my strange childhood, and so I set about looking for an initiation. What does the berserkergang mean to me? I am an ulfhedinn, and the wolf is the symbol of the worlds of the dead, and the dead themselves, and of the psychopomps, to the ancient Norse. Thus I experience the berserkergang as a unitary state with Odin upon Yggdrasil, Hangatyr. I experience him as Vegtam, who journeyed to Hel to raise a dead sorceress to reveal that which is hidden. I experience him as Wod, as the leader of the Wild Hunt. (Other animal-berserks would have different experiences and relationships.) This unity with him, this dancing with him brings out the wolf in me. The experience of what this unity is like is impossible to communicate to someone who has not had a similar experience, and anyways it is a rune, a mystery, and should not be spoken of. It has come to form the core of my religious life, my worship. It is an active form of prayer, as it were. It is the experience of Odin, that which cannot be had from an intellectual approach. And it has benefitted me in so many ways. I never get sick any more, and I used to be sick all winter, every winter. I never suffer from the back problems I used to. My energy is much higher. My depression is gone. All the parts of me fit together. I feel whole in a way I never thought possible. I took those things, those forces that were tearing me apart and learned to use them, to integrate with them, to make them work for me. I am a berserk because I have no other choice, it is what I am. It seems that of the very few other berserks I have met, or spoken to, or read the writings of, most have spoken of the following characteristics in common with mine: the "on-maximum" or "off" choice of emotions, the increased emotional sensitivity after a gangr (both in the temporary fatigue-related and in the long term permanent change senses). The experience of psychetachia and increased strength. The heightened senses. Many experience visions. Many, though not all, have the experience of becoming a predatory animal. Some have religious connections. Some do not. All feel this is the way they were born, and they have no choice to be any other way. Abnormally broad shoulders and large hands are very common amongst berserks. It is hypothesized that the broad shoulders are an adaptive trait we berserks have bred into us, to help us cope with the gangr via increased lung capacity. Hairiness is common, especially shaggy eyebrows or a unibrow in men. Berserks tend to be large and broad, or short and skinny. Coarse, ugly features are not uncommon. Of what benefit is the berserkergang in a larger, societal sense? There are two ways this is possible. One is that such practices serve as "release valves" for those born too different to fit into society, who might otherwise employ their energies in a destructive manner. But the other use is the more important one, for it is the very function in society that Odin serves (his function as Lord of Valhalla is actually incidental and only secondary). This is the role of the seidh-man, the warg, the outlaw, a person who deliberately lives outside of society in order to grow along a different path. You see, that which is static is dead. Life needs change to sustain itself. But it is difficult to sustain real change from within, for in the long run society tends to the conservative, to the static. So there is occasionally a need for a real outsider, something which can bring the new, which is in the Utgards, to the Innangards. An example of such in modern times is Einstein, a self-educated scientist at a time when science was at a standstill, unable to learn anything further. Much of modern scientific and technological development is because he came at things from a unique point of view. The berserkergang is a great torrent of power and inspiration that can be directed and focused in a number of ways. Any pursuit the berserk engages in can be rendered easier and more effective by it, including highly intellectual ones like art and poetry, science and math. But it has its price, and anyone devoted to benefiting from it must also devote his life to coping with it, a thing that is not always easy. I suppose it would be possible to learn the berserkergang without being born a berserk, but it would not in the long run be desirable. Berserks can easily develop strong emotional blocks and inhibitions involving the gangr, and find themselves with a strong mind-body connection that is working against them. All sorts of psychosomatic illnesses can develop as a result which can turn into serious long-term health problems. The ecstatic state here described as the berserkergang is the ecstatic state of Odin as Wod, the Furious, the Raging, the Possessed, the Inspired. It is a fire in the mind and the blood. But this is actually only one stage, and only one kind of unitary state. The other kind involves deafferentation of both parts of the OAA, resulting in an experience in which there is neither sense of self nor of anything else at all, even space or time. I call this ecstatic state the experience of Odin as Helblindi, the Hel-blind. (There is no record I know of as to why he was called this, but it is a name that describes the experience well.) It is as if Odin is first met as Wod, and the blood burns, and the mind gets so whipped up it contains everything. And everything contains as many darknesses as lights, as many positives as negatives, as many healings as sickenings, it contains everything and its opposite, and so is self-canceling. A great darkness, like the deepest part of night, arises from within. The fire burns itself, and the ego, and the world out. As Hangatyr or as Vegtam Odin descends into Hel and there becomes Helblindi. The effect this has on the gangr is fascinating. The swelling of the muscles reduces, as do the swollen tissues. The body hair lies back down. Breath returns to normal. The body starts to relax. But the mind does not return immediately, and when some imperfection in the helblindi state brings the berserk back out of it, the mind reverts by reflex to the last thing that was predominant. And this is the wod of the gangr. But the mind is different now. It only has a model, an approximation of the information it contained. Many details are lost. And herein lies the great advantage of this state. The mind, hel-blind, is preternaturally calm, still, and empty. There are no blocks, no inhibitions (either emotional or intellectual) to get in the way of, confuse, or obfuscate the image of the gangr. And as the details that were lost were random or small, the part of the model that remains is actually a little more pure in the gangr more often than it is not. Thus one becomes able to alternate between these states as if going up a ladder. One becomes wod, and burns oneself out and becomes helblindi. This purifies the mind and rests the body and so when one again becomes wod, it is even stronger and purer, which again burns itself out, etc. It is possible to develop the state even more strongly by learning to attain both the wod and helblindi states simultaneously in two different parts of the mind, thus splitting point of view in two, and further permutations, but this would be difficult to put into writing. There are three ways a berserk can approach the berserkergang. The first is to ignore it entirely. I do not recommend this, it will involve much suffering. The second is to learn just enough of it to control it. That is to say, to stop it from happening involuntarily, and maybe even to enter into it deliberately on occasion. These can be quickly learned and principally involve frothing (expressing enough emotion through growling, snapping at the air, hitting things, etc. to expend it all), and keeping emotions in and unexpressed (so their energies are not wasted) respectively. The third is to develop it as an ecstatic religious practice and/or as a martial art. For those inclined to try the third approach, I will here relate some of the training techniques I use. The simplest is throwing large rocks for distance. This is an easy way to both learn to focus the mind, body, and spirit at the right ways at the right times and to measure changes in strength. I use either a 50, 110, or 150 lb rock depending on what techniques I am working on. The standing broad jump is also good. Tie coins to the ceiling with string, stand in the middle of them, and using only the point of a single knife keep them all from hitting you or getting tangled up in each other. This develops fine control and sense of psychetachia. Do the same thing with either coins or small rocks outside, drive posts into the ground beneath them, and do the exercise standing only on the posts. Try a single coin, or two, blinfolded, to develop hearing, instinct, and working memory, as well as maintaining a unitary state on the fly with something as abstract as a set of circumstances. The important thing to develop intially is something I call the dagaz moment. Dagaz means "twilight", the moment of a thing becoming something else. This is because there are not two types of memory, as are commonly described, but three. There is the long-term, the short-term (a few minutes back), and the working memory. The working memory recalls from a fraction of a second back to a couple of minutes back. It is largely an unconscious awareness, and is unbelievably detailed. There seems, from experiment, virtually no limit to the detail of this working memory. I believe that this is because so little time has passed, that there has been no time for unconscious association, much less conscious processing. To put it another way, the mind is in a default unitary state with the object of its attention, it has perfect knowledge of it, because not enough thinking has occurred for it to be wrong about anything yet. Actions taken by reflex to an awareness of the contents of the working memory will be spot-on. Training can increase the length of time the image of the working memory remains pure. It can also improve the length of time one remains in the right state by learning how to slide from one dagaz moment to the next. Another thing which is important to learn, is a lesson from our predecessors. It is sometimes said that the berserkergang brought berserks to perform deeds they found reprehensible when they recollected their senses. Or they were such ruthless bullies they felt no remorse at all. This is because they took the easy approach to the gangr, and allowed pure rage to be their gateway. This, when it transcends itself into the emotion of the unitary state, can be a black, horrible thing. All transcendent rage requires is a certain lack of discipline. But other emotions can be relied upon. I use a combination of rage, love, fear, and greediness for new experience. (This last coming from the names of Odin's wolves, Freki and Geri, both of which mean "greedy"). This provides a much more balanced, but equally strong (I believe) gangr. So we do not precisely practice what our ancestors practiced, but it is fitting, for Odin has changed too. In conclusion, I don't have much else to say. I wouldn't trade my life in for any other, though the consequences of it are often hellish. I wouldn't recommend it if you do have a choice about it. And I would be interested in hearing from other berserks. I would be interested in hearing about any differences between your experiences and mine. I would be interested in any training techniques you use. I would simply be interested in hearing what the experience is like from another point of view. Especially how other animals are related to. I'm still trying to learn. You can contact me at wayland@uppsalaonline.com. See my other website, Somafera, for in-depth discussion of the practice of berserkergang as well as mainadism, Heroic Feats, dervishes, and other types of spiritual/physiological transformation.